• Twisted Logic. • Swallowed In The Sea. • The Hardest Part. 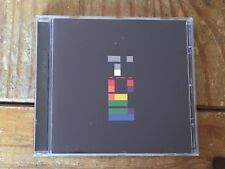 Coldplay CD - X&Y (2005, EMI). CD in VG condition. Coldplay - Live 2012 (1 Cd & 1 DVD). This Cd has been used. It has been quality checked and is like new. God Put A Smile Upon Your Face. Sold By Cd Junction. Us Against The World. Charlie Brown. Viva La Vida. Dont Panic. UK £0.00, extra copies add £0 per item. This item is in mint or excellent condition unless stated above. CATALOGUE No. (The disc appears barely played housed within the hype-stickered jewel case complete with picture booklet). UK £0.00, extra copies add £0 per item. UK Parcel Force 48 hour £9.50, extra copies add £9.50 per item. Speed Of Sound. UK £0.00, extra copies add £0 per item. REST OF WORLD [INC CANADA] £3.85, extra copies add £1 per item. USA £0.95, extra copies add £1 per item. CATALOGUE No. Look at pictures for more Guidance. Producer: Ken Nelson, Coldplay, Chris Allison. 7 Parachutes. Format: CD / Album. 1 Don't Panic. Coldplay - Mylo Xyloto. Mylo Xyloto. Sold By Cd Junction. A Hopeful Transmission. Princess Of China. This is a CD Album by Coldplay. in very good condition to both case and disc. it is on the EMI Record Label. Everything's not lost. We never change. High speed. CD and Case in Near Mint Condition. CD has been played with no issues. Format: CD. We specialise in Rock and Pop CDs. Classic Artists. Release Date: 20/07/2013. Issued in Japan by EMI. Coldplay - Viva la Vida (CD) Brand new not sealed. 5 out of 5 stars - Coldplay - Viva la Vida (CD) Brand new not sealed. 1 product rating1 product ratings - Coldplay - Viva la Vida (CD) Brand new not sealed. Viva la Vida. Speed of Sound. The Scientist. God Put a Smile Upon Your Face. UK £0.00, extra copies add £0 per item. REST OF WORLD [INC CANADA] £3.85, extra copies add £1 per item. In My Place. This item is in mint or excellent condition unless stated above. CATALOGUE No. Title : Coldplay - X&Y. Disc Condition: Good condition CD with a couple of scuffs and marks. Plays perfectly. Scans are of actual CD for sale. Every Teardrop Is A Waterfall. UK £0.00, extra copies add £0 per item. UK Parcel Force 48 hour £9.50, extra copies add £9.50 per item. We have offices near London in the UK, Las Vegas in the USA, Hiroshima in Japan. Square One. White Shadows. Price : £15.99. Record Label: EMI. Death And All His Friends. Strawberry Swing. Violet Hill (Album Version). Viva La Vida. Coldplay - High Speed. Dilated Peoples - No Retreat. Doves - Rise. High Speed. The Dandy Warhols - Cool Scene. The Catherine Wheel - Mad Dog. UK £0.00, extra copies add £0 per item. USA £0.95, extra copies add £1 per item. 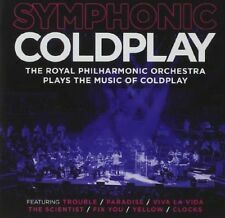 Title: Symphonic Coldplay. Artist: Royal Philharmonic Orchestra. Format: CD. Condition (Sleeve/Disc): New. Viva la Vida. Speed of Sound. The Scientist. God Put A Smile Upon Your Face. Coldplay, A rush of blood to the head, 2002 EMI Cd 11 tracks . Condition is Very Good. Dispatched with Royal Mail 1st Class Large Letter. Coldplay’s third studio album. The album was produced by Coldplay and producer Danton Supple. The album's cover art is a combination of colours and blocks, which is a representation of the Baudot code. Speed Of Sound. Thing I Dont Understand - Exclusive Recording. Proof - Exclusive Recording. UK £0.00, extra copies add £0 per item. UK Parcel Force 48 hour £9.50, extra copies add £9.50 per item. We have offices near London in the UK, Las Vegas in the USA, Hiroshima in Japan. Excellent / Very Good (VG ):Possibly light scuffs, plays good, overall very clean. Very Good (VG ): Possible light scratches, plays good, but may have the occasional pop. I also separate the vinyl from the cover, so there is no splitting of sleeve in transport. Title : Coldplay - A Rush of Blood To The Head. Disc Condition: Good condition CD with a couple of scuffs and marks. Plays perfectly. Scans are of actual CD for sale. MADE IN AUSTRALIA IN 2000 BY EMI. Most release details can be seen in the detailed pictures. SCROLL TO THE BOTTOM OF THIS PAGE TO SEE MY DEALS SUCH AS BUY 7 GET 5 FREE ECT. DIFFERENT DEALS EACH WEEK. 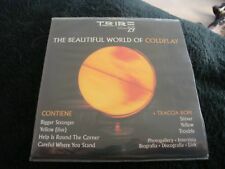 This is a CD Album by Coldplay. A whisper - 10. A rush of blood to the head. God put a smile upon your face. Politik - 2. In my place. NEAR MINT - JUST DOWN FROM MINT - VERY MINOR IMPERFECTION(S). DISC IN MINT CONDITION . MINT - DISK IS WITHOUT FLAW, CASE AND/OR ARTWORK ARE ADEQUATE BUT OBVIOUSLY IN USED CONDITION. WORN - DISC MULTI-SCORED BUT NEVERTHELESS PLAYABLE. Coldplay's debut album from 2000 featuring hits such as Yellow and Trouble. Disc and inlay in very good condition. Jewel case has a crack, which is clearly visible in the images. God Put a Smile Upon Your Face (Live). Mylo Xyloto (Live). Hurts Like Heaven (Live). In My Place (Live). Major Minus (Live). Yellow (Live). Princess of China (Live). Viva La Vida (Live). COLDPLAY LEFT RIGHT LEFT RIGHT LEFT SEALED CD PROMO LIVE. Clocks, Fix You, Strawberry Swing, Viva la Vida. 9 tracks in all. Condition is Like New & sealed. Dispatched with Royal Mail 1st Class Large Letter. This is the Taiwanese release from 2001 and is on the EMI label. This was part of my late husband's eclectic and treasured music collection. I'm just plucking up the courage to make a start on it - I don't think either of us realised how emotionally draining this would be, I kind of feel like I'm "getting rid" of Gary and nothing could be further from the truth. The Hardest Part. UK £0.00, extra copies add £0 per item. REST OF WORLD [INC CANADA] £3.85, extra copies add £1 per item. USA £0.95, extra copies add £1 per item. This item is in mint or excellent condition unless stated above.